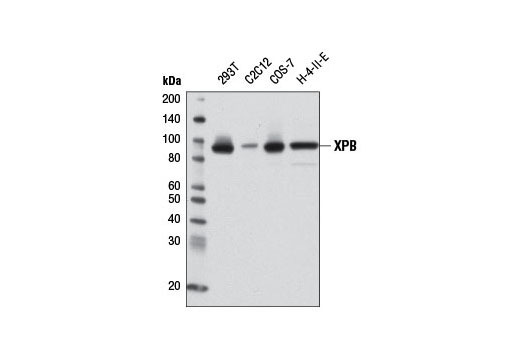 Western blot analysis of extracts from various cell lines using XPB (2C6) Mouse mAb. XPB (2C6) Mouse mAb recognizes endogenous levels of total XPB protein. Monoclonal antibody is produced by immunizing animals with recombinant protein specific to the carboxy terminus of human XPB protein. XPB and XPD are ATPase/helicase subunits of the TFIIH complex that are involved in nucleotide excision repair (NER) to remove lesions and photoproducts generated by UV light (1). XPB and XPD are 3’-5’ and 5’-3’ DNA helicases, respectively, that play a role in opening of the DNA damage site to facilitate repair (2,3). XPB and XPD both play an important role in maintaining genomic stability, and researchers have linked mutations of these proteins to Xeroderma Pigmentosum (XP) and Trichothiodystrophy (TTD). XP patients have abnormalities in skin pigmentation and are highly susceptible to skin cancers, while TTD patients exhibit symptoms such as brittle hair, neurological abnormalities, and mild photosensitivity (4). In addition to their role in NER, XPB and XPD are involved in transcription initiation as part of the TFIIH core complex (5). The helicase activity of XPB unwinds DNA around the transcription start site to facilitate RNA polymerase II promoter clearance and initiation of transcription (6). XPD plays a structural role linking core TFIIH components with the cdk-activating kinase (CAK) complex that phosphorylates the C-terminus of the largest subunit of RNA polymerase II, leading to transcription initiation (7). Oksenych, V. and Coin, F. (2010) Cell Cycle 9, 90-6. Evans, E. et al. (1997) EMBO J 16, 6559-73. Riedl, T. et al. (2003) EMBO J 22, 5293-303. Lehmann, A.R. (2003) Biochimie 85, 1101-11. Drapkin, R. et al. (1994) Nature 368, 769-72. Holstege, F.C. et al. (1996) EMBO J 15, 1666-77. Rossignol, M. et al. (1997) EMBO J 16, 1628-37.